Wsdl11Reader A class that can parse WSDL 1.1 definitions, derive a graph structure from the content, and output that graph structure to a supplied SequencerOutput. WsdlI18n The internationalized string constants for the org.modeshape.sequencer.zip packages. WsdlLexicon A lexicon of names used within the XSD sequencer. 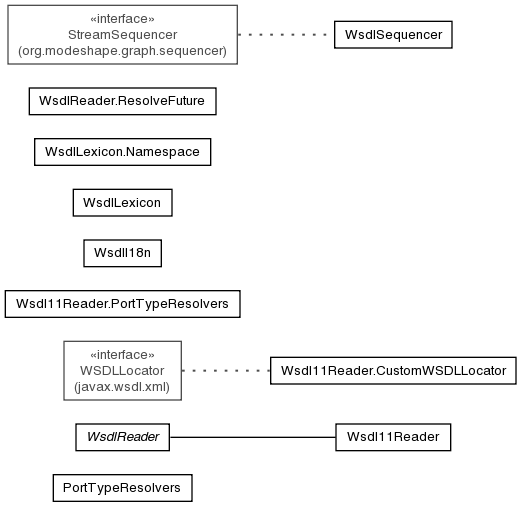 WsdlReader<T> A class that can parse WSDL definitions, derive a graph structure from the content, and output that graph structure to a supplied SequencerOutput. WsdlSequencer A sequencer that processes and extract the schema object model from XML Schema Document files.